The attack on Verdun was originally planned on Saturday 12 February. On the night of the 11th /12th of February the German troops were placed in position. The German infantry was waiting in their 'stollen', thousands at a time, for the starting signal. At the very last moment the attack was cancelled. It had began to snow and rain severely, it was freezing, the wind had increased and turned into a storm and the visibility was very poor. 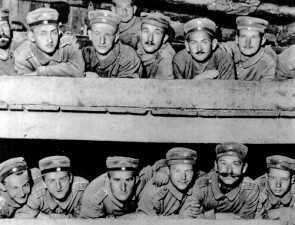 A large part of the German troops had to remain in the very primitive 'stollen' that were not equipped for a long stay. The 'stollen' were not heated and flooded. The overall condition of the troops got worse every day because of stomach and colon problems and malnutrition. After nine days of hardships the weather conditions had improved in such a way that the signal for attack could be given. Most likely the delay saved France from defeat: the two French divisions, which had been appointed as reinforcements at the very last moment, could therefore be placed into position. It also gave them the opportunity to make last minute improvements in their defence. Monday morning 21 February 7.15 The heaviest bombing that had thus far ever taken place in a war starts over the entire Verdun front on the left and right side of the river Meuse and had a frontal latitude of 40 kilometres. 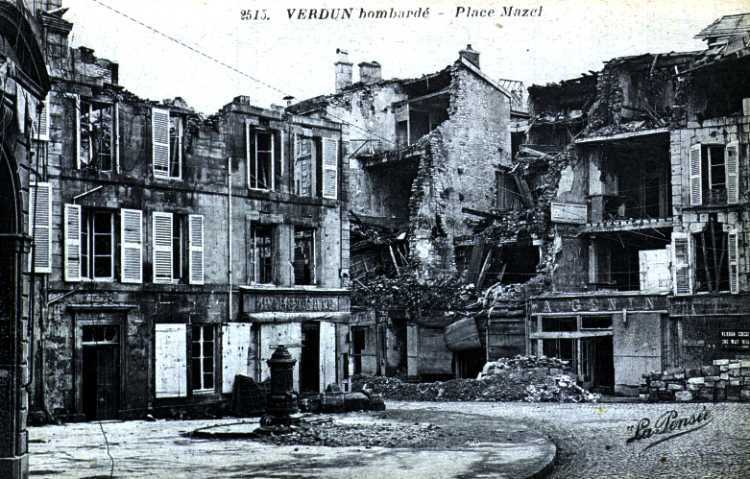 Verdun itself is also heavily bombarded; the entire civilian population is evacuated. The bombardment was of such force that it took reinforcement troops sometimes 8 hours to move 3 kilometres ahead. The French trenches are completely pulverised, phone lines and artillery destroyed entirely. Men are ripped to pieces, are buried underneath the earth or disappear into thin air when hit. Ancient trees are completely uprooted; human remains are hanging in the branches. It seems like the world is coming to an end. This horrible bombardment lasts more than 9 long hours. At 17.15 the German soldiers reappear from their 'stollen' and begin their attacks on the Bois d’Haumont (by the VIIth German army corps), the Bois des Caures (by the XVIIIth German army corps) and the Bois de l’Herbebois (by the IIId German army corps). The Germans expect all human life to have disappeared but to their surprise the bombardment is less effective as has been expected and persistent and heroic resistance is given from all directions. In these attacks the Germans use the flame-thrower as an offensive weapon for the first time. When the evening comes the Bois des Caures (defended by Colonel Driant and his men) and the Bois de l’Herbebois are still in French hands; the German war-machine is losing its strength. Only the Bois d’Haumont is completely in German hands. The German attack could have gone on without resistance to the villages of Brabant and Samogneux, but when approval is given to do so, it is already too dark to continue and the march has to come to a halt. The French headquarters hardly respond. It regards the German attack as a local and unimportant event. Tuesday - 22 February The fierce shootings start again, if possible even more intense than the day before. The left bank of the river Meuse and the Woevre sector (on the right side of the Verdun salient) is also heavily bombarded. The German attack concentrates on the village of Haumont and the Bois des Caures, where colonel Driant is surrounded after heavy combat. He loses his life in this attack. The remaining soldiers retreat into the village of Beaumont. 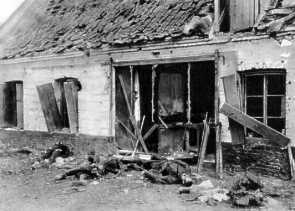 The village of Brabant is taken under fire by the Germans and the French decide to evacuate that evening. At the end of the afternoon the villages of Haumont and the Bois des Caures are completely in German hands. The Bois de l’Herbebois, however, is still French, due to fierce resistance. The French headquarters are still not responding: the incoming reports are still not showing the seriousness of the situation. Wednesday - 23 February Heavy fighting occurs again this day. The village of Brabant falls into German where the 351st French regiment offers fierce resistance and withdraws at Samogneux. The battle for the Bois de l’Herbebois continues with great violence. A French counterattack at the Bois des Caures warded off. From the nearby Bois de Wavrille, the Germans attack the Bois de l’Herbebois from the flank. The 51st French division withdraws but makes the Germans bleed heavily at the occupation of the Bois de Fosses. The fighting over Samogneux is fierce but the village is still in French hands. But for how long? The French are forced to withdraw unto the line Samogneux-Beamont-Ornes. The situation becomes critical: the French are driven away from their first line of defence; their second and third lines of defence, which were weak to begin with, are entirely vanished - there is almost nothing that can stop the Germans now. At the French headquarters it is slowly becoming clear that the situation is far more serious than initially thought. Joffre sends one of his members of staff to Verdun in order to observe the situation. 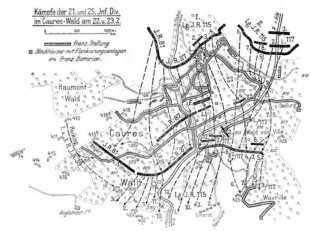 Thursday - 24 February The Germans bring in new offensive troops into the battle. These are bombarded heavily by the French artillery from the left bank of the river Meuse, which is after all not being attacked by the Germans. This was one of the points of criticism against the plan of Falkenhayn who wanted to attack, solely on the right riverbank. In spite the heavy bombardment the Germans succeed in taking Cote 344, as well as the Bois de Fosses, the Bois de Chaume and the village of Ornes. At the end of the day the situation becomes extremely critical, because the second line of defence is lost as well. But precisely on this day French relief troops have arrived: the XXth army corps, under command of general Balfourier is going to replace the XXXth army corps of general Crétien. The troops are getting cold, tired and hungry from the forced marching during the day but this new troops are thrown into the fray immediately. 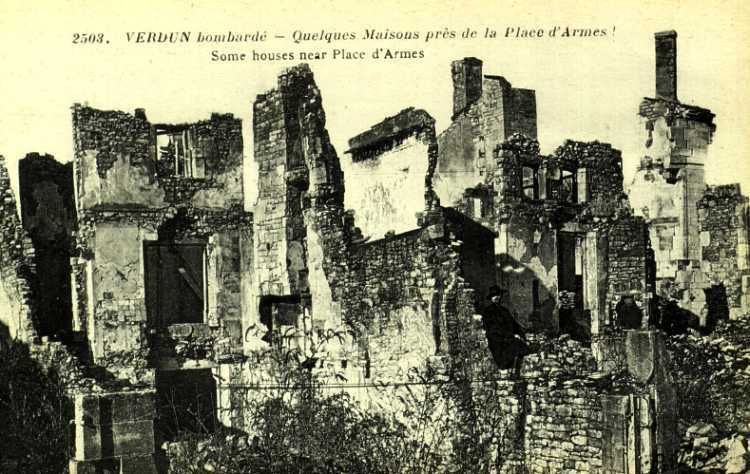 Despite the crisis situation in Verdun, the French headquarters receive positive information; the German offence is supposed to be weakening and counterattacks would be made. In the evening the chief of the central army group, general Langle de Cary, calls and delivers a very pessimistic report. 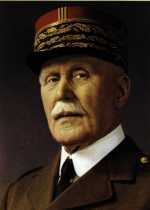 Joffre’s chief of staff, general De Castelnau, advises to send the IId French army, under the supervision of commander Phillipe Pétain, as reinforcement to Verdun immediately. He himself leaves for Verdun instantly with the authority to make the necessary arrangements. Friday - 25 February The battle rages on and the French withdraw, sometimes uncoordinated and panicking, further and further. The Germans move on and they are approaching the infamous Fort of Douaumont, inch by inch. The fort’s entrances are poorly defended, because the French troops are withdrawing. The incredible happens: four platoons of the IIIth (Brandenburg) army corps see the opportunity to take the insurmountable Fort Douaumont independently. It becomes clear the fort has a minimal garrison of 56 French reservists. 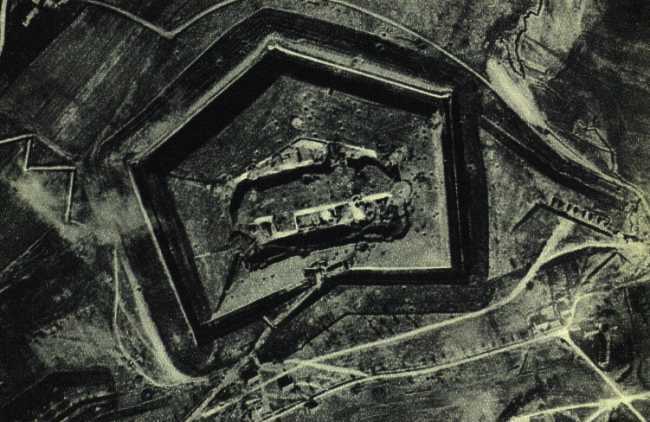 This small garrison is due to the fact that at the fall of Liège in 1914, the surrounding forts were completely destroyed by the Germans and their heavy guns. The French supreme command was therefore of the opinion that the forts along the eastern border could no longer be used for the defence and had them dismantled. The guns, as far as they were movable, were taken away to be used by offensives somewhere else. Shortly before, a command has been given to send an army unit to the fortress as reinforcement but somebody has forgotten to pass on the command. (Note: It is said that this misconception of the French supreme command has caused, in the course of the following months, the lives of at least 100.000 French soldiers [in French they are called: poilu’s]). 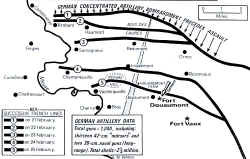 The conquest of the Douaumont fortress has some immediate consequences on the battlefield. The 37 African Division (consisting of the feared Soaves, who would never make prisoners of war and the Moroccan skirmishers) which is responsible for the defence of the line between Champneuville, Vacherauville and the village of Douaumont, expect the German army to break through, now that Fort Douaumont has fallen and that they will be cut of from Verdun by a pincer movement. This division withdraws without sheer necessity to Côte de Belleville, the last hillside before Verdun. 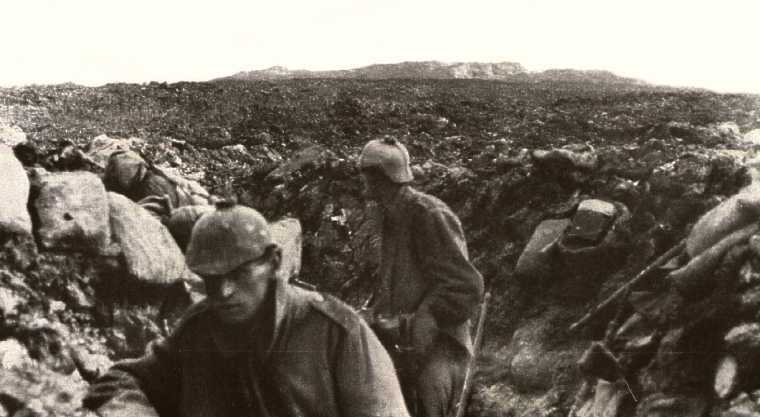 Verdun is within reach of the Germans now but they do not realise that the positions are abandoned and they do not seize the given opportunity. General De Castelnau occupies himself, at the arrival at Verdun on the 25th of February with the question of how Verdun can be saved. Evacuation of the right riverbank is out of the question because a retreat is not in keeping with the French military ideas of those days. De Castelnau orders that the right riverbank must be kept at all costs. He takes another measure: general Herr is dismissed and makes room for general Phillipe Pétain, the commander of the IIth French army. His direct order is to organise the defence of the right - as well as the left riverbank immediately. The exhausted divisions of the XXXth army corps are replaced with fresh troops from the XXth army corps, which are under the command of general Balfourier. Pétain gives the order to form a line of defence between the remaining fortresses (which are occupied immediately) and to maintain this line of defence at all costs in order to gain time, necessary to commit reinforcements of his own IIth army corps to battle. This also made it possible to bring artillery, in a brief period of time, to the right riverbank of the Meuse and most of all to the left bank of the river Meuse, in order to bring the German army to a hold. 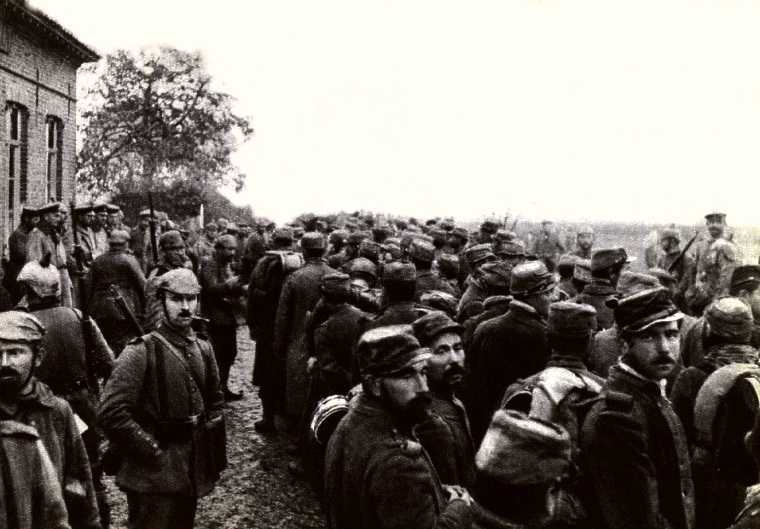 Pétain also organises the supply route between Verdun and the hinterland. 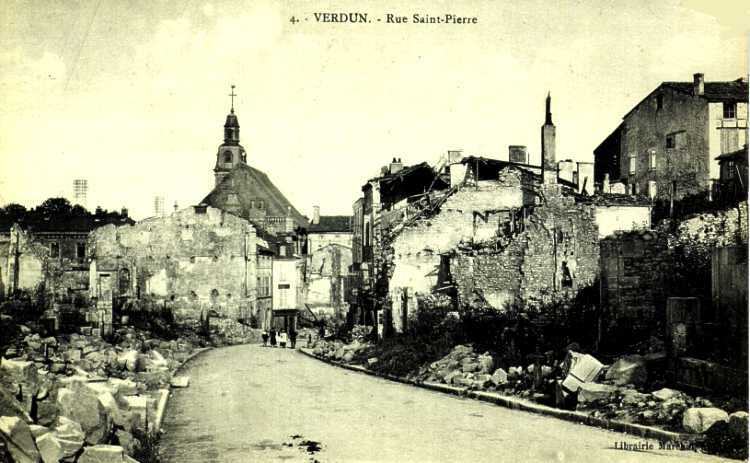 There is a narrow connecting road between Verdun and Bar-le-Duc which is improved and maintained in such a way that this becomes the life line for the French troops in Verdun. Later this road is called the Voie Sacrée [Holy Road]; the road along which long lines of people and materials are transported day and night, to and from Verdun. The Voie Sacrée is Verdun’s life line during the Battle of Verdun. At this moment gaining time is the most important thing: The Germans have to be stopped for 2 to 3 days, at all costs. The opportunity to do so is found in the village of Douaumont, which is situated right next to the fort and is not yet occupied by the Germans. The village is being defended by the just arrived French 33rd infantry regiment: an elite regiment that used to be under the command of Pétain himself. Saturday - 26 February After raking Fort Douamont the Germans are planning to march all the way through to Verdun. The German Vth Infantry Division’s task is to take the village of Douamont and march on to the Thiaumont- and Froideterre-fortifications. The VIth Infantry Division receives the assignment to occupy the Bois de la Caillette and the Bois de Hardoumont, which are situated east of Douaumont. At first this attack goes smoothly: the Bezonvaux-fortification is deserted and quickly taken. But then the German troops encounter fierce opposition from the French, who are firing at the Germans from the higher situated hills around the Hardoumont-fortification, in order to bring them to a hold. The German artillery has no back-up because this fortification is registered, due to a flaw in the co-ordination, as already taken. French firings are fierce and it is only after assistance from the earlier warned German artillery, this fortification is taken. Fort Vaux is in sight but from there the French have a clear shooting area and they keep the Hardoumont-fortification under fire permanently. For the Germans there is no way to get trough; the German attack stops here. Just as every other village in the Verdun region, the village of Douaumont is turned into a very heavy armed fortress; it has more than 30 French machine gun nests. On top of that the French bring a heavy battery of howitzers into action against the attacking Germans. The French artillery fire is excruciating: The Germans have to march on in clear view of the French and experience many losses because of that. The German trenches are full of corpses en wounded soldiers. The 52nd infantry regiment for instance, has lost 600 out of 900 men. Eventually the Germans have to retreat. Sunday - 27 February In the morning the village of Douaumont is under attack for 4 hours; even a Big Bertha (a 420 mm heavy gun) is put into action. A snowstorm, however, decreases the visibility. The Germans deploy the 105th (Saxon) Infantry Regiment. 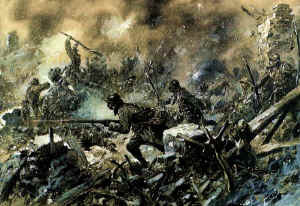 In the attack on the village this Regiment is decimated, because of the French machine guns which destroy their flanks. The German artillery gets the message, through a false report, that the attackers have already arrived at the village and they shift their fire towards the Thiaumont-fortification. At the besiege which follows, the French soldiers fire while standing in their trenches, undisturbed by German artillery fire, from a height at the attacking German troops, which suffer awful heavy losses. Eventually the Germans enter the village in the middle of a heavy snowstorm and the man against man fights continue until deep in the night. The fighting with knives, spades and bayonets is merciless and losses on both sides are enormously. Regiments report casualty-figures of more than 50 percent. After 2 days no territorial gain has been made at all. Monday - 28 February The next day the fights continue. The remainders of the 105th Saxon infantry regiment has to march on, even though they are being fired at from two sides by French machine guns that fire just a small distance from the ground. Another regiment sees the opportunity to enter the village and leaves behind horrible casualties. With the man against man fights no prisoners are made. Heavy territorial fighting goes on during the entire day but the village is still not taken. On both sides losses are terrible. Four German regiments are put into action: out of 3500 men, 2000 are dead or hurt. With these fighting’s the expression 'the Hell of Verdun' is used for the first time. 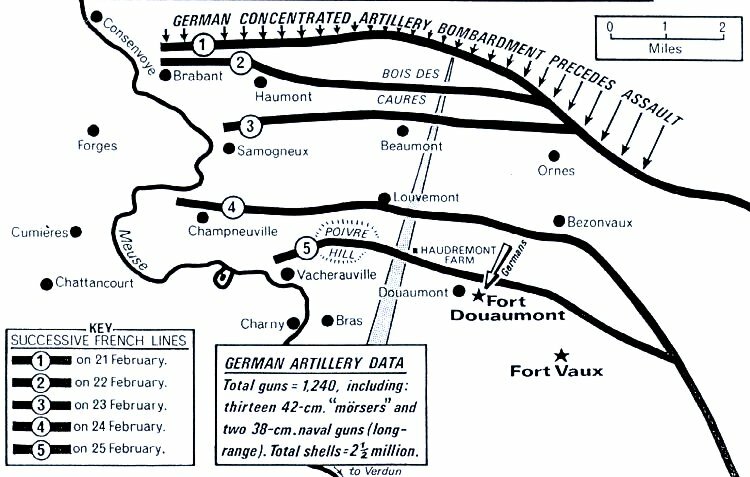 Tuesday - 29 February On this day also the battle for the village of Douaumont continues. It is still fiercely protected by French artillery fire. De attackers have many difficulties to go forward and suffer many losses in doing so. When the evening falls German pioneers appear with flame-throwers that spit a 30 meter long beam of fire. Because of the demoralising effect this attack has, large groups of French soldiers surrender. 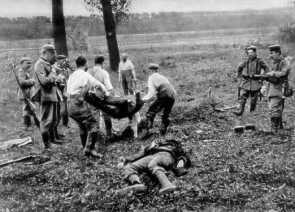 During the journey back to the German territory they have to carry the badly wounded Germans with them. After another day of heavy fighting, where the French are fired at from Fort Douaumont by the Germans, the village is at last taken on the Thursday - 2 March. The defending soldiers of the 33rd regiment surrender. Among the prisoners is Charles the Gaulle. It is clear that the attack on Verdun is stagnating. The same conclusion is reached by the German headquarters in Stenay. Measures are being contemplated. General Pétain has reached his goal for now: The German attack has been put to a halt and the French army even gained more than the necessary 2 to 3 days. An important cause for the stagnation comes from the side of the Germans: because of the fact that German troops have gained a lot of territory the passed week, the front lines are now out of reach of their artillery support system. The battlefield has turned into a huge flooded swamp of grenade shell-holes and the displacement of artillery is only possible through immense effort. The most important supply of ammunition stagnates. In the front lines, problems occur in the supply of spare troops, ammunition, materials and replacements. Field kitchens are nowhere to be found; food has to be carried to the front. Drinking water is very difficult to come by. The wounded cannot be carried away and cannot receive medical attention - many are left to die in the freezing cold. The dead can not be buried because of the heavy shootings and are tossed into a shallow trench; at a next artillery bombardment the corpses will reappear. 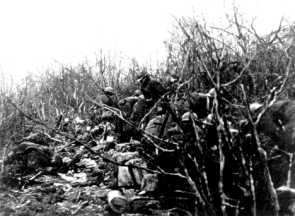 The weather conditions are extremely bad: cold, snow and rain torture the men on both sides in the trenches on the battle field. Falkenhayn had neglected to deploy spare troops when there was an opportunity to break through; an opportunity which presented itself on the 25th and 26th of February. A fast break through, however, was not included in the tactical concept of Falkenhayn. He wanted the French army to 'bleed to death' and not to achieve a speedy victory. The result was that the bruising battle, which Falkenhayn wanted, had now become reality. The victims are not only French, as he had pictured it. Germans also become victims of this battle more and more. Verdun seems to be deteriorating into a mass slaughter, as never seen before. Another important cause for stopping the German attack is the fact that the French have brought in reinforcements and under the command of Pétain, the French artillery has at last been sufficiently put into position. Within a couple of days the battle strength has been increased to 500 pieces, which are primarily stationed at the left riverbank. From there, well protected behind the hill tops and out of reach from German artillery, they have a devastating impact on the attacking Germans. On Sunday - 27 February an attack was launched by the VII German army corps to overtake the Meuse and to eliminate the French artillery firings, however this attack fails miserably. When the battle of Verdun stagnates at the beginning of March 1916, the German army leaders reach the conclusion that the French artillery fire had to be eliminated from the left riverbank before a successful march to Verdun can be made along the right riverbank. The Battle for the Flanks is about to begin.